In the 1970s Reader's Digest magazine tried their hand at feature films with musical versions of these classic stories by Mark Twain, with Tom Sawyer (complete title Mark Twain's Tom Sawyer: A Musical Adaptation) in 1973 with Huckleberry Finn the following year, both with not just songs but also their full screenplays written by the legendary Sherman brothers, Richard and Robert. These movies weren't as well-remembered afterwards as other movies of their time, being issued on home video briefly by CBS/Fox Video in the early 1980s, on laserdisc (in letterbox format) by MGM/UA in the 1990s, and on DVD disappointingly panned and scanned in the mid-2000s. Twilight Time has now served up both of them on a single Blu-Ray disc following their usual limited distribution model. 1973's Tom Sawyer stars Johnny Whitaker in the title role, famous for the TV sitcom "Family Affair" and starred in "Sigmund and the Sea Monsters" from Sid and Marty Krofft afterwards. He makes an enthusiastic Tom, good-natured but not having much sense of proper behavior. Hanging around with local orphan Huckleberry Finn (Jeff East, best known for playing the teenage Clark Kent in 1978's Superman: The Movie) doesn't exactly help things. While the parents of both kids are dead, at least Tom has been taken in by his mother's sister Polly (Celeste Holm) who has raised her two children Sidney (Joshua Hill Lewis) and Mary (Susan Joyce) much more respectably. This leads to the three of them doing one of the first musical numbers, a lively song sung as a round (with each singing a different verse simultaneously) about how messed-up he is. The original story written in 1876 is followed rather closely, with a number of episodes including Tom conning the neighborhood kids into doing his chore of painting a fence (resulting in one of the more memorable musical numbers "Gratifaction") and eventually the main conflict when Tom and Huckleberry witness a murder late at night, with their friend the town drunk Muff Potter (Warren Oates) first taking the blame until Tom outs the real guilty party Injun (meaning American Indian, something I didn't pick up when I first read the book long ago) Joe (Kunu Hank, later known as Henry O'Brien) who goes on the run but threatens to return and kill Tom for squealing on him. The judge's daughter Becky is played by a young Jodie Foster, who previously appeared with Whitaker in Disney's Napoleon and Samantha. Shot on location in Missouri, it's an enjoyable production with songs that are both lively and emotional, although none of them have gone on to become well-known favorites. I do however have to call out the pivotal murder scene that takes place at midnight- it was clearly shot in broad daylight with the picture then darkened to make it look like night, but it likely won't fool anyone. 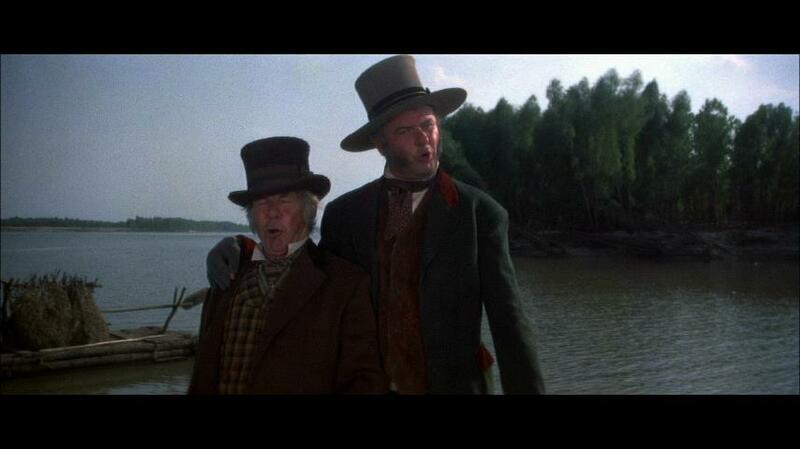 Nevertheless, the movie did well enough to be followed up in 1974 with Huckleberry Finn, also written by the Sherman Brothers with Jeff East reprising his previous part. 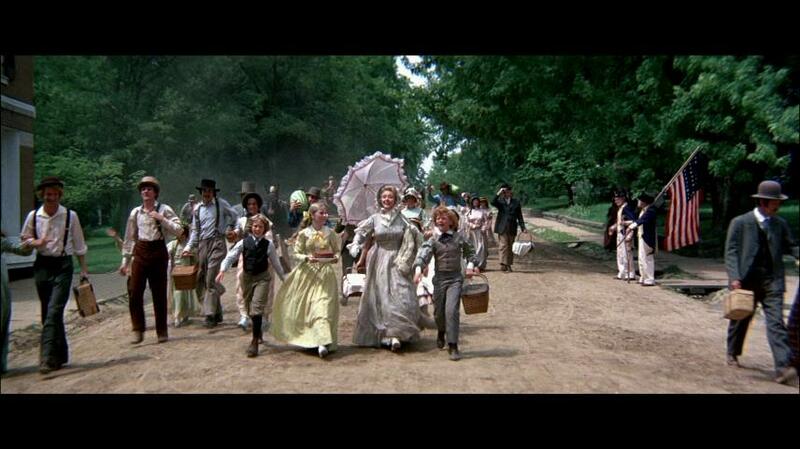 It picks up a bit after Tom Sawyer ends- since Tom took off to St. Louis at the end he isn't around the town of Hannibal to appear in this one, leaving Huck on his own. He's been taken in though by "Widder" (widow) Douglas (Lucille Benson) who tries to give him a more normal life, although he's a bit resistant to that and often runs off to his old haunts by the river, also befriending the local slaves including Jim (Paul Winfield). 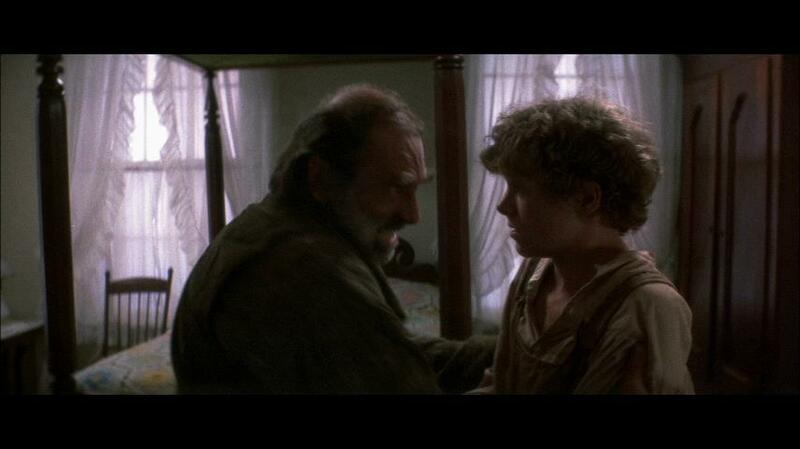 It turns out that his father really isn't dead after all- he reappears (played by Gary Merrill) and decides he wants his son back, though he's a bit abusive towards him. He tells the "Widder" that she can have him back for a price she can't afford, and both Huck and Jim figure that the best way for her to get that money will be for her to sell Jim off to slave traders. Jim already has a wife and child who he wants a better life for and Huck doesn't want to stay with his dad, so the both of them leave town on a raft down the Mississippi River to the free state of Illinois where Jim plans to start a new life and bring his family over. The original book from 1884 was another that I was "encouraged" to read about a hundred years later but never made it all the way through, so I can't say how much the story here differs, but I found some of the events a bit awkward- perhaps it's blasphemy for me to criticize such a highly-regarded story but it seems that Huck and Jim go off-course a bit too much leading to a few episodes. In one instance Huck ends up being taken in by a rich family for a few days, with Jim just waiting by the raft for him to return. They then run into two con artists (Harvey Korman and David Wayne) who basically hijack the story once they appear. Kicked off a riverboat for swindling its passengers, they get a ride on the Huck and Jim's raft after convincing them that they're the king and duke of France. Korman hams it up in the extreme the moment he appears onscreen and doesn't let up after that, and I found him mostly annoying in this role. They first stop in a town selling tickets to a play and then skip out with the money before they perform it, then hatch up an elaborate scheme to swindle a family out of their inheritance after hearing that their rich father had just died. Huck mostly just tags along in these events, and once again Jim is left to wait by the raft and the narrative practically forgets about him for a while. Regardless of how Mark Twain originally wrote this story, I couldn't help but want the two main characters to stick to the river and get on to their better life in Illinois, which they sing about in this movie's most memorable song before taking off. MGM had done hi-def transfers of these movies a while ago, despite opting to instead use pan and scan masters instead for the DVD releases. Twilight Time includes both movies here on one Blu-Ray disc but the picture quality does not suffer from compression artifacts or banding. 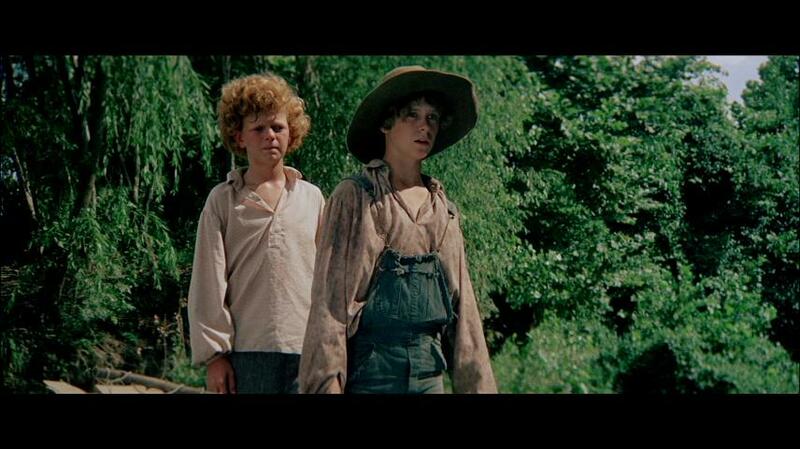 Tom Sawyer is the better looking film of the two, nicely detailed with colors that aren't overly bright. Huckleberry Finn appears to have been shot through an odd camera filter, as many scenes have dark diagonal lines that such a thing would produce as well as an overall soft look throughout- there is also some noticeable damage in one scene which may or may not have always been there. Tom Sawyer gets most of the audio attention here, with three different mixes all presented in DTS Master Audio. The first is a new 5.1 mix created by Twilight Time for this release after the original magnetic 4-channel mix was found to be a bit lacking- there's a rather in-depth article about this on their website. That 4-channel mix is also included (encoded as a 4-channel track, but my Oppo player output it as 5 channels in PCM in order to accommodate Twilight Time's usual "whip" sound effect on the disc's menus) as well as a third in 2-channel. The quality of all of these mixes is clean for the most part, except for one moment that is noticeably muffled from possibly damaged elements. Huckleberry Finn only gets a 2-channel track here, which still sounds fine in Pro-Logic although it seems to have also been a discrete 4-channel track on film as optical stereo hadn't come along yet. Both movies include hearing-impaired subtitles with the song lyrics shown in italics. MGM's laserdisc of Tom Sawyer issued in 1994 included a few extras that are carried over here, still in standard-def. A 10-minute "River Song Featurette" shows some production footage, with a narrator selling the movie as being set in a time when "pollution, overpopulation and even income taxes were unknown to most people." A theatrical trailer in 4x3 letterbox (with the 1994 United Artists logo substituted for the one that originally appeared) with similar narration is also included, along with film of a piano rehearsal of the song "Gratifaction" with the Sherman brothers assisted by John Williams. The commentary track from that disc with director Don Taylor and both Sherman brothers is also here, along with a new commentary track with Richard Sherman and historian Bruce Kimmel, who now runs the Kritzerland record label specializing in soundtracks, and directed the cult favorites The First Nudie Musical in 1976 and Spaceship in 1981. I don't remember if the Huckleberry Finn laserdisc included the trailer but that's included here in HD and the proper ratio. Standard for Twilight Time discs, both movies also include a 2-channel isolated music track that features the songs without vocals, though I heard some occasional bleed-through of voices on the Huckleberry Finn track. Twilight Time's usual "catalog" is also on the menu, showing the covers of all of their releases to date including those that have sold out. Both of these stories have been done for the screen numerous times, but of course I always say there's never a better way to do a story on film than as a musical. While these may not be considered classics as much as the Shermans' previous efforts Chitty Chitty Bang Bang or Mary Poppins, they're still essential viewing for fans.